At Forests Forever we do love trees, but our work to protect forests isn't just about saving trees. Our efforts are also about protecting clean and abundant water, air quality, and the stability of our climate. Forests play a crucial role in all of this. And beyond these life-sustaining benefits, forests provide us with places to refresh our spirits, to teach our children, and to reconnect with Nature. As recreation destinations, California's forests are extremely valuable to our economy, creating jobs and driving consumer spending that far outstrips the logging industry's contribution. We need our forests to be healthy and beautiful because they provide us with much of great value beyond just timber and other commodities. Forests Forever is a broad-based grassroots organization. That means we mobilize folks like you to put pressure on our elected officials to keep our forests healthy and productive. Together we are a voice for the forests. 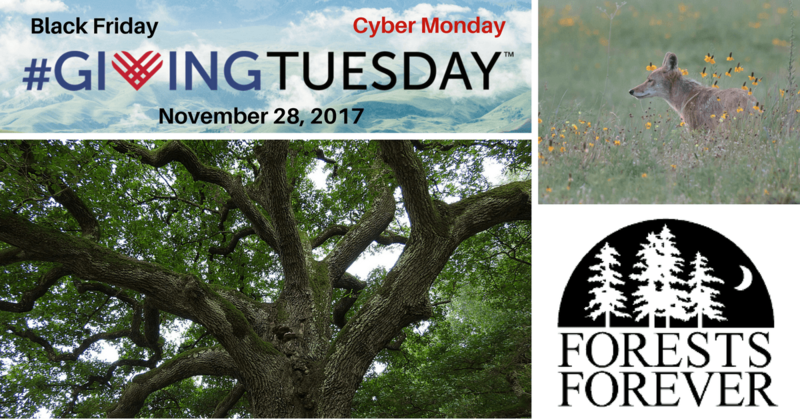 Help us continue to protect California's priceless forest heritage with a generous gift this #GivingTuesday. Please give a generous gift to protect California's forests.